It all started one day when I decided I needed a decent-sized mixer to build my new electronic studio around. The hunt was on, and after some months I found exactly what I was looking for - an unloved 2416. The new mixer just after arrival. You can see a few knobs and slider caps are missing, and some remnants of masking tape. I mentioned unloved above. The power supply is missing, some knobs and slider caps are missing, and it looks like there have been a couple of front-panel incidents, with one pot shaft definitely pushed in, and one input channel strip looking a bit out of line (you can just about see it in the picture below) which I'm guessing is due to a pot replacement job on that channel. Work to do... which is exactly why I bought it! This mixer has 24 input channels. These feed into 8 groups. There are 16 tape returns. Final mixdown goes to 2 stereo (Left/Right) channels. This desk is of the Split format, with the tape returns positioned above the group faders, which are to the right of the master section. This is in contrast to the more compact Inline format which puts the tape returns into the input channel strips. A surprise bonus feature I've found is that at some point in its life (either factory-fit or a rather neat tech.mod) is direct outs for all 24 input channels. The 24 jacks are mounted on the rear of the meter pod, and the installer has even gone to the trouble of nicely labelling them. Not sure yet if they are pre- or post-fader. Also, being of vintage design, it is rather more spread out than modern budget mixing desks. It is 1.35m wide, compared to just under 1m for a modern 24-channel 8-bus mixer (e.g., Mackie 24:8). That's a whopping 43% difference, and it is certainly noticable! What is it with the colour? I've read several disparaging comments about the brown colour of the Mk I and Mk II consoles (the later Mk III adopted a battleship grey colour scheme). I like the brown scheme. It reminds me of those early EMI consoles from Abbey Road -- I remember one that was in the reception of EMI's Central Research Labs sometime around early 1990. It is a warm colour, in tune with the warm sound this console reportedly has. Time for some spec oggling. I have pulled together what I think are the main spec figures from the various manuals. Note that the manuals are not entirely clear in some places (it looks like it was written by a contract writer who didn't understand the finer points of the technical details) so I have clarified some details where appropriate. MODEL 2416 - 24 input channels, 8 outputs plus stereo mix, 16 track monitoring. Connectors: XLR mic inputs and main outputs; ¼" jack all other circuits. Maximum output level: +21dBu into 5 kOhms or more. +18dBu into 600 Ohms. Peak indicator warning at 3dB before clipping overload. Microphone equivalent input noise: -125dB all models 200 Ohm source. The noise figures come from the Mk III manual as the Mk II manual does not include numbers for the 2416. Comparing the 1616 model in both versions I'd say the Mk III was about 1dB lower noise. Not a huge difference. The spec quotes the LF EQ as being 120Hz and 80Hz, yet the schematics and the front panel text both say 120Hz and 60Hz. Allen & Heath are good enough to support their old products by providing many documents online through their website. I will also be using the details from the Mk.III model to indicate where the original A+H engineers thought improvements could be made. The approach I plan on taking with this project is to adopt design and component choices in keeping with the age of the mixer. So, for example, op-amps will be TL072 and NE5532, not modern devices from the likes of ADI or TI/BB. Update: After some further investigation the plan is slightly modified. Keep TL072 where there's no benefit in upgrading. Keep NE5534 in the main post-fade amps. Replace TL072 with either NE5532 or OPA2134 depending on the surrounding circuit. Other component changes will be natural upgrades, for example replacing carbon film resistors with metal film resistors giving lower excess noise and tighter tolerances (better for CMRR on the mic pre-amp for example). Design changes will be kept to simple changes either to improve the noise performance, or due to other component changes. For example, reducing resistor values where possible to reduce Johnson noise, or because of changes in op-amp type (JFET input to BJT input). Capacitors are an interesting one. Obviously any ceramics in the audio path will be replaced by film types (polystyrene or polypropylene or polyester, in that order of preference). Electrolytics will be refreshed with brand new Panasonic high-temperature (105°C) low-ESR types, with appropriate changes to value and/or voltage rating. Generally pretty good. No sign of rust on the main panel (I've seen some desks on eBay with varying amounts of rust - not good). The front arm-rest will need some attention, but that's removable and should be quite easy to treat any rust and respray. These new caps are shallower than the original ones, the result being they are quite high up above the panel surface. So need to look into some sort of spacer to go between the slider and the panel to reduce this down to, say, 1mm. There are some missing knobs, and some missing knob caps. If exact replacements are not available from AHB then the only option is to fit a completely new set, of a style in keeping with the rest of the board. Check, and replace if necessary. Might go for Switchcraft or Neutrik if they fit. By all accounts the original power supply was a bit under-rated. According to the schematic it provided ±15V @ 1A and +48V at 100mA or so. Mine was missing, so a new one is required. I have sourced an Allen & Heath RPS11 linear power supply unit in need of fixing from the usual place. It can provide up to 5A per rail according to the spec sheet. A high-current connector is on the back, and after much hunting around the net and examining the connector on my PSU I have found the matching cable-mounted connector is a Hirose JR21PK-10P(71) 10-way plug (Mouser order code 798-JR21PK10P71, current price �13.28 + VAT as of 15th July 2017). All I need to do is assemble a suitably beefy power cable to go from the PSU to the mixer with the Hirose connector on one end and a 5-pin XLR socket on the other. It is a bit rusty, but considering what it cost me to buy plus parts I don't mind a bit of surface rust! And it is just cosmetic--the internals are all fine. For anyone contemplating working on an RPS11 I would point out that from what I can see the only difference between this and the RPS10 is the splitting of the output transistors onto separate heatsinks on the back, and the change to a toroidal transformer. You can find the RPS10 schematics on the Allen and Heath website, but as the RPS11 is still an active product they haven't released that schematic. 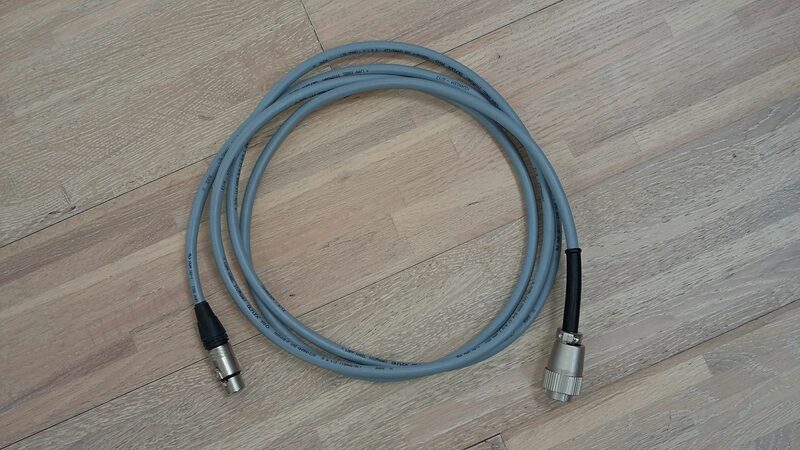 To bring the power into the mixing desk I have also made up a suitable cable. For those playing along at home, I used a length of LAPP KABEL Olflex 150 18SWG 5-core, with a suitable 5-pin XLR at one end and the aforementioend HRS connector at the other. Note that for the HRS connector I also used a Hellerman rubber strain relief boot to support the cable at the rear of the plug. On the XLR end it is already a super-tight fit. Note that the circuitry in the mixer (predominantly op-amps) are fine with 16V supplies, giving a small (+0.5dB) increase in headroom. There is much experimenting to be done here. I don't want to waste effort on changes that'll have no beneficial effect on the audio (lower noise, lower distortion). Some changes will be obvious age-related maintenance fixes (replacing electrolytic caps, replacing pots), while other changes (I hate the word "upgrade") will be done with some experimentation and testing. Recap with Panasonic FM or FC electrolytics, Wima FKP or MKS for smaller values. Reduce resistor values where I can to reduce Johnson noise. Check all pots and sliders, replacing if necessary. Replace pre-amp transistors with 2N5087. The NE5532 has a much higher nput bias current than the TL072, which will impose a DC voltage across the fader, which in turn will result in scratchy noises as the fader is moved up and down. To fix this a series capacitor from the wiper is needed to block the DC, and then a high (say, 47k-100k so it doesn't load the wiper too much) bias resistor from the op-amp input to GND. (Interesting to note that in the master boards they *did* put DC blocking caps in the fader amps so it should be a lot easier to do the straight upgrade. Hmmmmm....). The other half of the op-amp is used to drive the peak detect circuit. Looking at the schematic there are quite high resistor values used around it so these need checking to ensure the peak detect continues to work as intended. One option is to replace the TL072 with OPA2134, which has FET inputs for low input bias current, but significantly lower noise and distortion than the vintage TL072. However this needs some strong evidence to back this theory up considering the cost of the OPA2134. The ZTX214 PNP transistors in the pre-amp have a quoted noise figure (NF) of 10dB. Not great, and you can see they tried to improve on that by paralleling two transistors on each side, improving the SNR by 3dB. However, I am going to try the 2N5087, which appears to be a drop-in replacement, and with a NF of only 2dB, giving an 8dB improvement! All those meters! 18 of them!! And each one has an incandescent bulb to provide illumination. And they blow. And they're fiddly to replace. After discussing this idea with Tony Allgood of Oakley Sound I'm going to experiment with keeping the incandescent lamps and add a soft-start controller and also run them at about 70% of their rated current. This should extend their operating life by several times, so that in theory they won't need replacing so often, if at all. I might also make the brightness manually adjustable (perhaps a small pot on the rear of the meter pod) so it can be adjusted to suit the light levels in the studio. What Has Changed Between MkII and MkIII? It is reasonable to assume that the circuit changes made to the System 8 MkIII were to improve the performance of the desk. I think we can ignore any effect on the audio of changing the colour scheme to charcoal grey with grapefruit yellow and dawn grey. Nice. Cosmetic changes. Panel colour is now charcoal grey with grapefruit yellow and dawn grey legend. Knob colour is grey with red, grey and blue knob caps. The side cheeks are black. Fader reverse switch added to each of the eight groups to exchange monitor level control with group fader. Balanced output option available for the stereo and group outputs. May be retro-fitted to the mixer. Microphone gain is increased by 6dB to allow a maximum overall gain of +74dB. Noise performance of the stereo, group and auxiliary circuits is improved. Switch type is changed providing smoother mechanical performance and improved serviceability. Revised Group PCB assembly design replaced the two Group assemblies used previously. General specifications and performance other than the details above are unaltered. Owner Handbook Mk 3 and Service Handbook Mk 3 are now in use. I have highlighted the changes that are of most interest. Fortunately there are only four changes, so it should not be too much a task to reverse-engineer a set of change notes for each block. As already noted the only change that should be here is the increase in the mic gain. The change box on the schematic confirms this: "UPDATE TO MK3 INCREASED MIC GAIN". This change is easy to understand: the pre-amp gain is increased by the claimed amount by the changes to R17 and R20, while R9 is adjusted to reduce the line input to the pre-amp to compensate for the increased gain. Now while it may be a good idea for microphones, it is rather unfortunate to attenuate-then-amplify the line-level inputs, since that will worsen its signal-to-noise ratio due to the additional noise of the pre-amp. On the face of it these are reasonable changes: increasing the capacitors will improve the low-frequency performance, and removing the resistors will remove one source of thermal noise. This is by far the largest change. 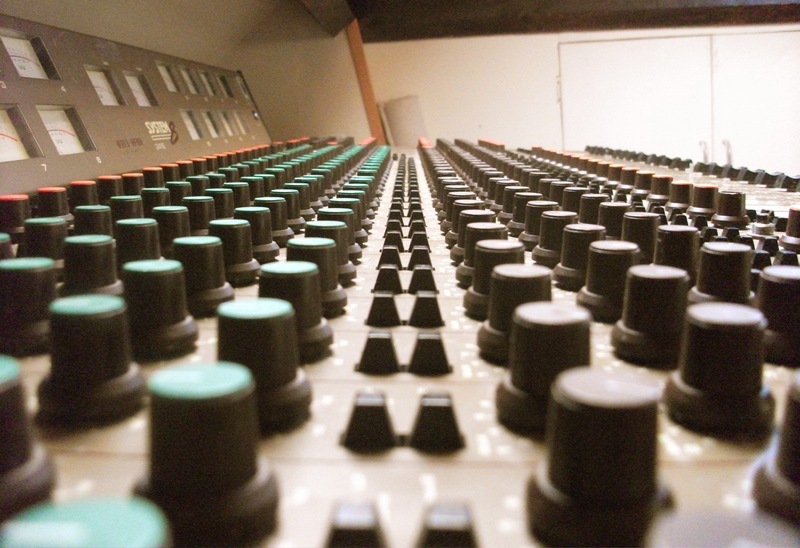 On desks with sixteen tape inputs there are sixteen single-channel input boards, one per channel. This is good as it means the smaller desks (128, 164, 168) only have the four or eight PCBs they need. In the MkIII series they removed these smaller desks and focused on the larger desks (1616 and 2416). 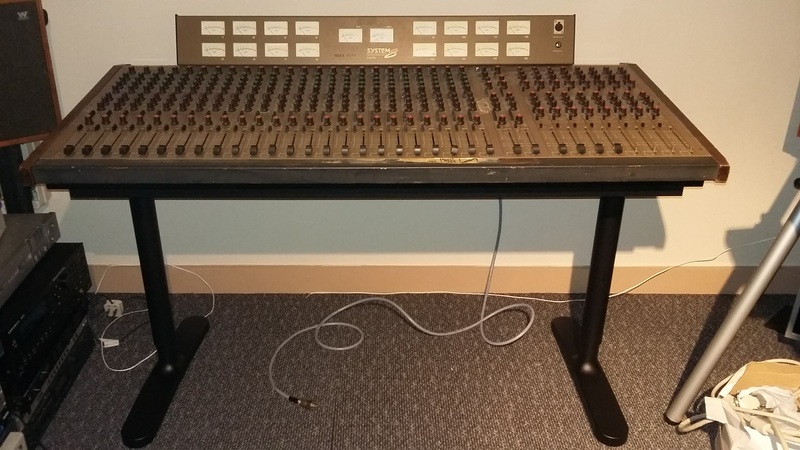 Now that all desks have sixteen tape inputs they combined two boards into one, which would have been cheaper to manufacture and assemble into the frame. LEVEL pot reduced from 47k to 10k. Don't understand the first change -- it raises the lower -3dB point, cutting out some bass. Could be a BOM optimisation? The second change -- removing that resistor -- is a definite improvement (less thermal noise). And the third change is understandable as a consequence of adding the FADER REVERSE switch so that now both the LEVEL pot and the fader are the same impedance. Note also that the level pot on the un-reversable channel is also now 10k to be consistent. A quick analysis in SPICE of the main function blocks shows some interesting frequency response information. Note: These figures assume that all 22p capacitors are fitted to the op-amp feedback resistors. One nice thing about old technology is that it is relatively easy to get replacement parts, either brand new, or scrounged from other places. In this case pretty much everything can be found new. All resistors, capacitors, diodes, transistors and ICs can be found new from all the main component distributors. Here in the UK we have Rapid (UK only), RS (Allied in the US) and Farnell (Element14) as the main contenders. 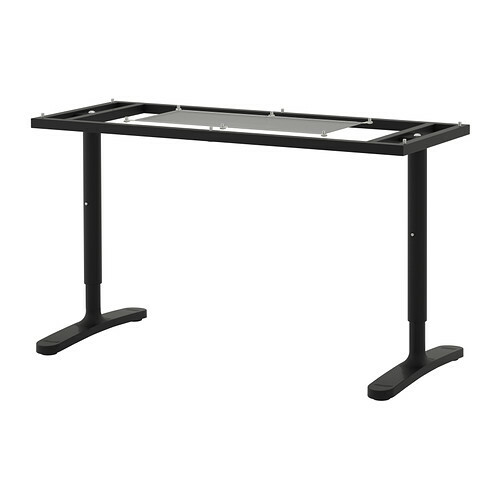 There are eight different pot types used in this desk. They can be a bit tricky to find as you really need to replace them with the same make due to variations in mechanical dimensions. Maplin and Audio Maintenance stock most of the values, but without brackets. The more esoteric pots with brackets are special orders direct from OMEG who still manufacture them. Note: This is the "British" notation, whereas Alps swap the meaning of "A" and "B" (which is actually easier to remember: "A for Audio"). The switches are all standard Alps SPUN series 2- and 4-pole push switches. The tricky bit is that they are mounted in metal brackets to provide mechanical support. So replacing them involves carefully prising apart the metal fingers, replacing the switch, then pushing back the metal fingers to hold the switch in place. So far the only vaguely tricky part to find is the PFL relay. The original NF2-12 is no longer made, but a compatible replacement NFEB-12V is still available from Farnell, code 1200946. The SQ-10 meter is still being made by Anders, and is stocked by both RS (code 220-368) and Farnell (code 7758219). Again, all standard parts so there should be no problems finding replacements. The lovely brown knobs are non-standard parts it seems these days. So your best bet is either find someone who is parting out an old System8 (see below), or get a similar vintage AHB mixer yourself as a parts donor. Same for the button caps and switch caps. The faders have 8mm tabs, and you can still find supplies of suitable fader caps (see above). The following people are breaking System 8's for parts. If you need original parts for your System 8 then you could contact them. NOTE: These people are listed here as an aide, I offer no guarantees of any sort. Any trade happens between you and them, nothing to do with me. 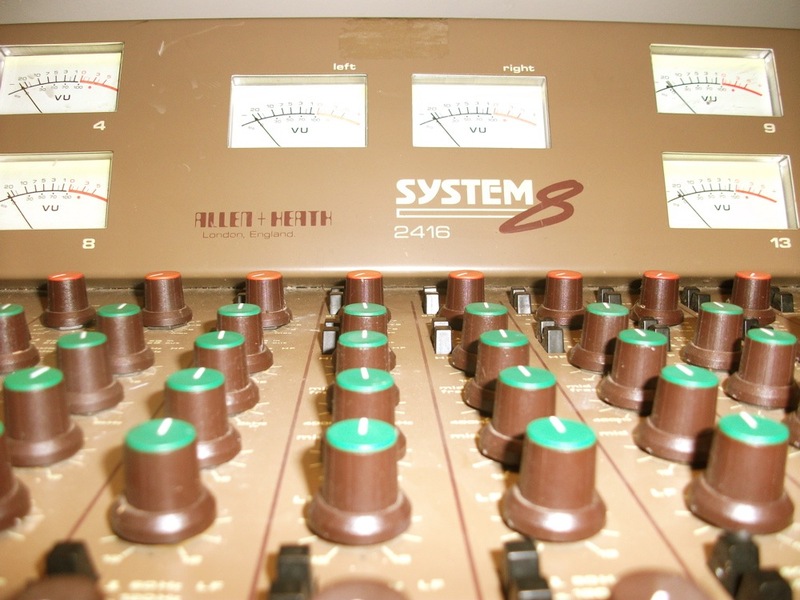 The System 8 mixers have been around for many years, and were there at a critical time in British pop. I'm slowly gathering together snippets of hints at artists that have or still use System 8's in their studios and productions. Mungo Jerry apparently used a System 8 on the classic In The SummerTime hit. Martyn Ware of Human League and Heaven 17. Bill Nelson's "The Echo Observatory" Recording Studio had a 24:16 Desk (likely a Mk.II). Both The Devil and The Oscillation: From Tomorrow were recorded on a System 8 (in 12:8 formation). If you have any additional information, or corrections to the above, please contact me. For £50 I couldn't get the raw materials for less, plus my time, so definitely a great deal. Only assemble the metal frame together (you don't need the plastic bits or the cable tray), and I recommend putting some rubber antislip pads on the top of the frame to stop the mixer sliding off in moments of enthusiasm! Important: Adjust the frame height before loading the mixer - once it is on the frame you won't be able to adjust the height as the mixer is much too heavy!